Today we are kicking off the Bobble Blog Hop of 2018! This fantastic blog hop is the 2nd annual blog hop curated by Michele from Stitch & Hustle. 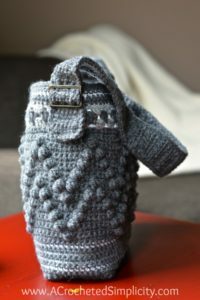 You may have guessed it already, but this year’s blog hop theme is the crochet BOBBLE! Bobbles are a hot stitch this year so the theme is very fitting. 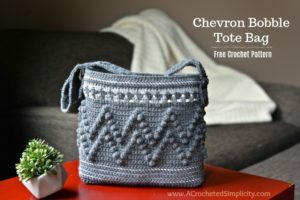 Come join us and hop from blog to blog to check out all of the new crochet designs, meet new-to-you designers, visit some of your all-time favorites, and ENTER TO WIN an awesome prize pack sponsored by our friends at Lion Brand Yarn!! You DON’T want to miss this!!! Enter to Giveaway at the bottom of this post. I was very honored to receive an invite to join Michele & the talented group of designers/bloggers she put together for this event…. there’s a whole lot of talent in one place! A BIG THANK YOU to Lion Brand for supplying the yarn for this project. Yarn: Lion Brand Wool Ease Yarn (See Yarn Note Below) in the colors Oxford Grey (3 balls) & Grey Heather (1 ball) & ZZ Twist Yarn in White (1 ball). Crochet Hook: H/8/5.00mm; G/6/4.00mm, or size needed to obtain gauge (My favorite crochet hooks are the Clover Amour Crochet Hooks, I’ve never had an ache in my hand since switching). First stitch of each row is worked in the same stitch as the turning chain, unless otherwise specified. Pattern repeats are written using brackets [ to ]. What’s written inside the brackets from [ to ] is one full repeat. There are also partial repeats and they are noted inside brackets within * to *. Instructions are clearly written and note which to work. Do not fasten off. 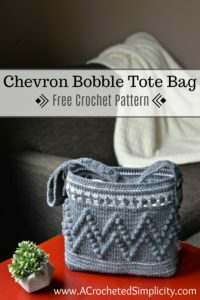 Continue on to Chevron Bobble Section. Note: The Ad-Free PDF includes a Bonus Chart for this section. Rnd 12: Rep Rnd 2. Rnds 13 – 16: Rep Rnd 5 – 8. Rnd 18: Rep Rnd 2. Rnd 20: Rep Rnd 2. Do not fasten off. Continue on to Upper Section. Fasten off. Weave in ends. Continue on to Strap. Row 2: Ch 2, linked dc in each st across. Turn. Rep Row 2 until strap measures 29″, or desired length. Rnd 1: Continuing on from the strap, rotate to work into the sides of the rows along a long edge, work (2 sc into the side of the next st, 1 sc into the side of the next st) rep along the long edge, rotate and work 1 sc into the bottom of each foundation ch, rotate to work into the sides of the rows along the next long edge, work (2 sc into the side of the next st, 1 sc into the side of the next st) rep along the long edge, rotate and work 1 sc into each st across the last row. Do not join. Continue on to Slip Stitch Edging. 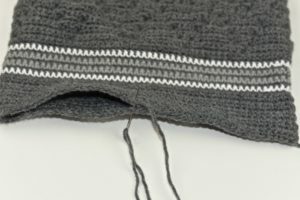 Note: Adding the slip stitch edging will help keep your strap from stretching out. Rnd 1: Continuing on from the Edging, slip stitch in each st around the perimeter of the strap. Adjust your hook size as needed to keep the tension even. Stitch count isn’t crucial. Use Special Join Technique (click HERE for tutorial). Fasten off. Weave in ends. Continue on Attaching the Strap. Finished size of the strap is approximately 2″ W x 29″ L.
If you’re using the metal slides, slide one end of the strap through 1 slide. Repeat for the opposite end. 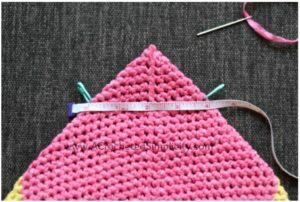 Sew each end of the strap to the upper portion of the bag. I sewed my strap onto the bag by stitching both above and below the slide. Weave in ends. Step 6: Turn your bag right side out. The photo below left shows what the inside of your bag will look like. The photo below right shows what the bottom of your bag will look like. Note: The bag shown in the photos is of the Strawberry Lemonade Tote. Please stop by Lion Brand on Facebook and thank them for sponsoring this awesome giveaway! Open to readers WORLDWIDE, except void where prohibited by law. 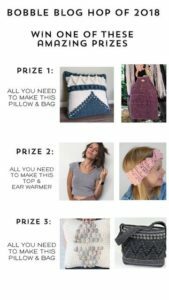 To Win, enter by 11:59pm CST on October 12, 2018, using the Rafflecopter widget above. 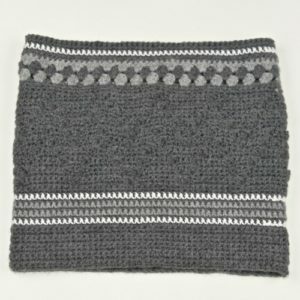 3 Winners – Each winner will receive all the yarn needed to make 2 of the blog patterns. Hello . 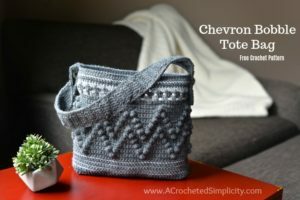 If I want to make a bigger bag ,with how many stitches do I increase? Thanxs in advance. Most of the pattern is a repeat of 10, until you get to the granny section and that’s a number divisible by 3’s.